Progress continues to be slow but steady. 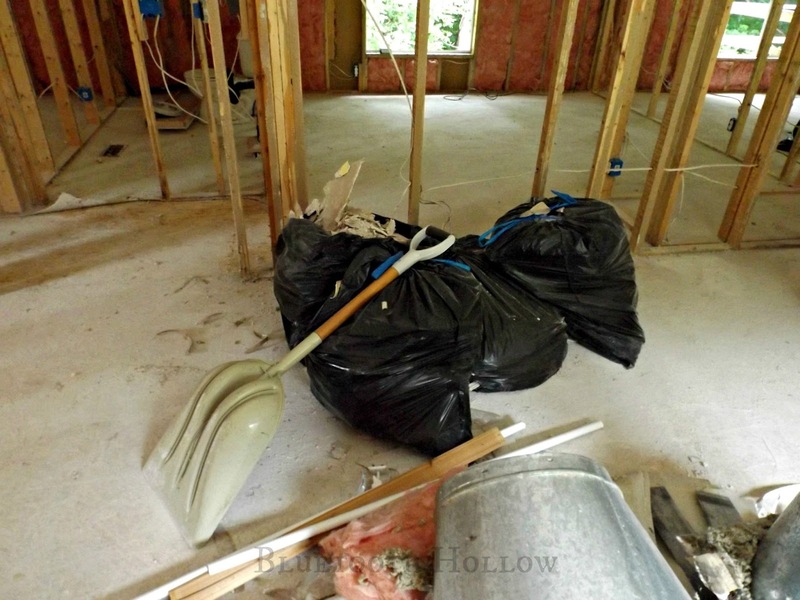 The last couple of weeks we continued pulling staples and nails (that is all I see whenever I close my eyes), chipping out glued drywall, and cleaning up the floors. We (well, I ) also ripped out a section of carpet in the master closet that had been glued down. I basically had to grip it with the claw end of a hammer and work it up, bit by bit. This carpet also happened to be soaked with years of dirt and pet urine. 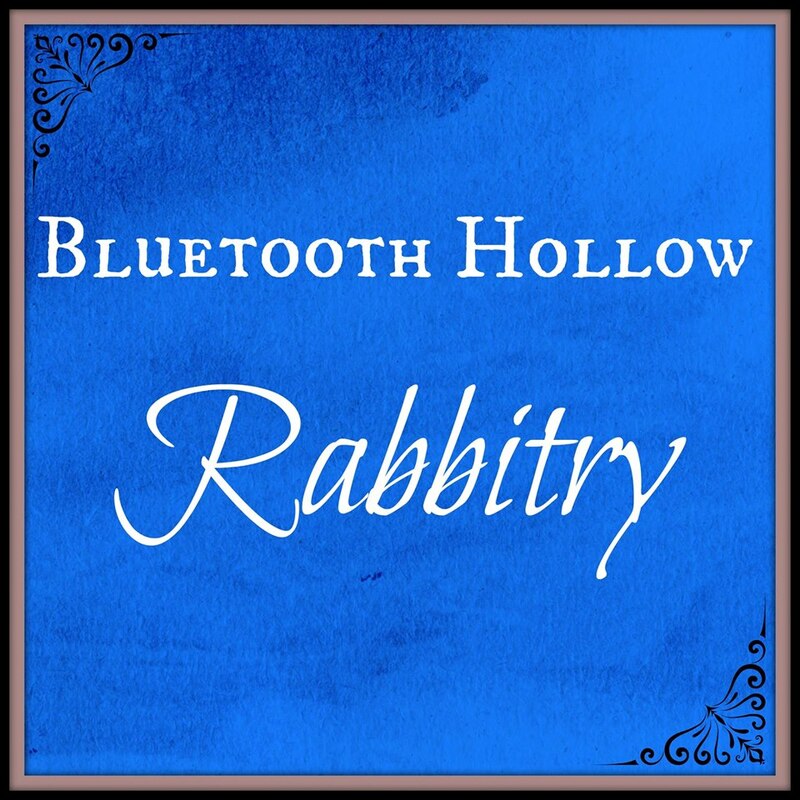 It was harrowing. 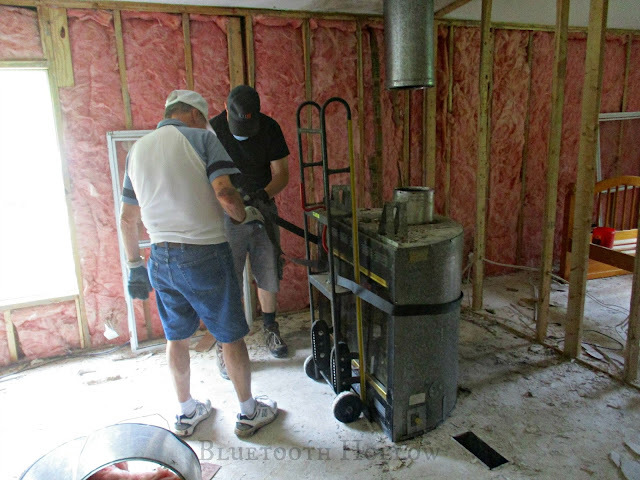 We've been limited to working in the mornings and the evenings, since we won't be able to turn the AC unit back on until the walls are built around it again. And since Mark and his dad have been working on the electrical outlets, they've had the power turned off; which equals no ceiling fans. It's been averaging in the high 80's, low 90's, with the humidity at least 75%. So, yeah. HOT. Mark taking a breather on our lovely back porch. Check out the milkweed growing out of the steps! They managed to get the fireplace insert out of the house (which we will either sell or donate to Habitat for Humanity). The windows and doors have been moved into the barn to get them out of the way (doors we are keeping, windows we are not), and are pulling up any remaining linoleum. We still need to move the toilets, and get rid of the old vanities. We met with our drywall installer (is that the correct term?) last week, and realized we are much further from being ready for him to start than we originally thought. He strongly recommended that we go ahead and replace the remaining electrical outlets (29 at last count), go ahead and remove the old shower (which we realized would not fit through any of the doors), and install 2 x 4's in all the places where the walls aren't flush (so he will have something to screw the drywall to). We debated the shower for a bit, and knew we wouldn't regret having it replaced, but soon found out that there was nothing to be found (even for manufactured homes) in that size. While we could always move walls and plumbing and go with a different size, we decided to just keep the one we have to save time and labor. At this rate, it's looking like the drywall won't be going up until July. We are just so limited in our time. Mark has two days off a week, but is working overtime to compensate for the vacant ranger position (which won't get filled until this fall). Some days he works from 10 AM - 10:30 PM, which doesn't really leave any time for house work. 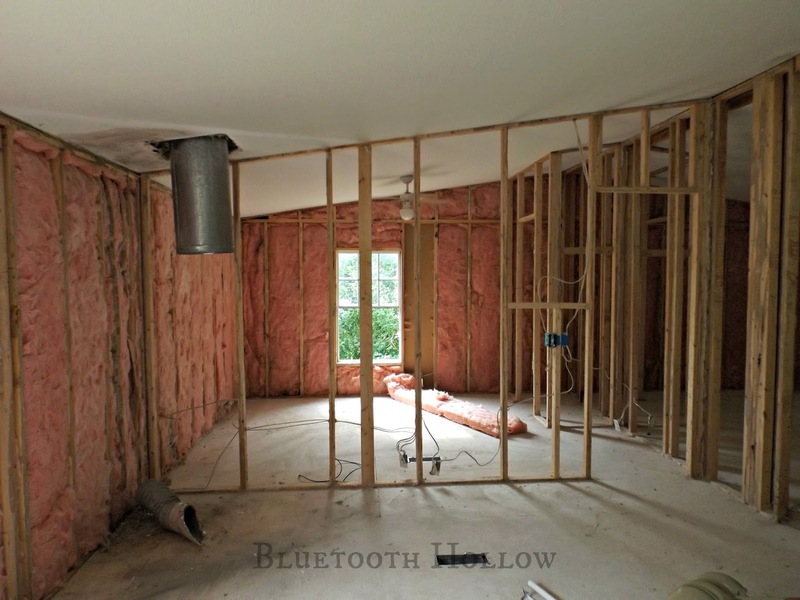 As of today, all of the outlets and switches have been replaced, the new tubs and French doors have been ordered, the extra studs are going up, and they are beginning to replace the insulation. Even though we still have a long, long road ahead of us, it feels good to see some progress. I knew when we took this on, it would be a one step forward, two steps back process. It always is. Really feeling like two steps backward, at this point. 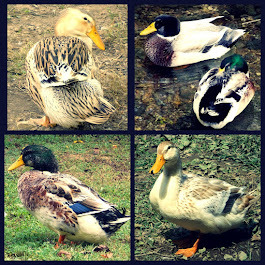 The rest of the photos in this post are brought to you by Mark's new SLR camera (which he is loving). The Rose of Sharons are also blooming. I've decided the large of the two can stay, since it doesn't look as ratty, and helps shade the west end of the house. Today's subject is more of a shrub than a wildflower - but it is a flowering plant, nonetheless! 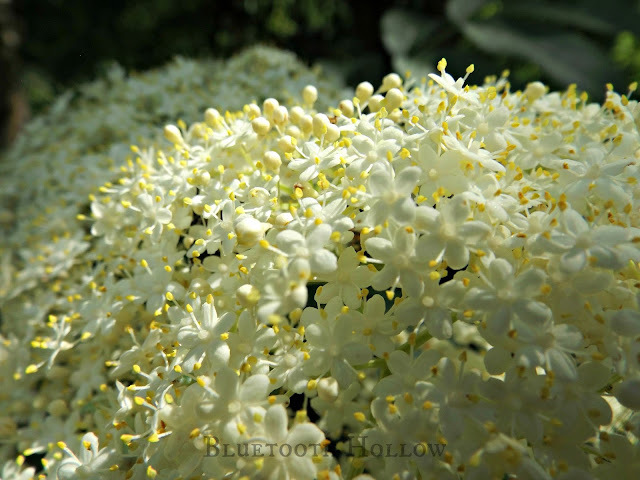 This shrub is in full bloom right now in the mid-South, with large conspicuous panicles of white, lacy blooms, sometimes towering 13 feet high. Common Elderberry is pretty familiar to most people, at least by name. 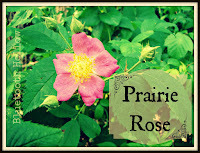 It can be found growing across nearly the entire country and throughout much of Canada. 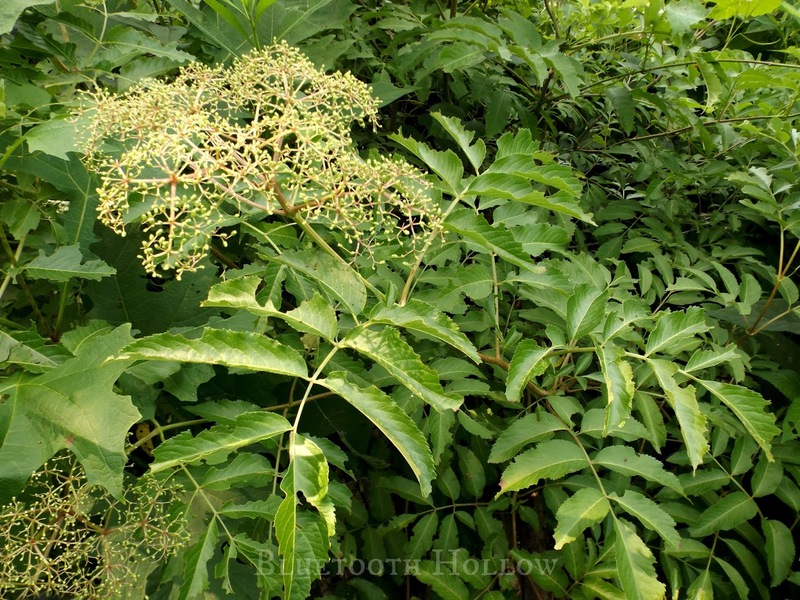 Elderberry prefers moist, humus-rich soil, and is commonly encountered along roadsides, forest edges and wet, brushy fields. It can form impressive thickets whenever conditions are favorable. 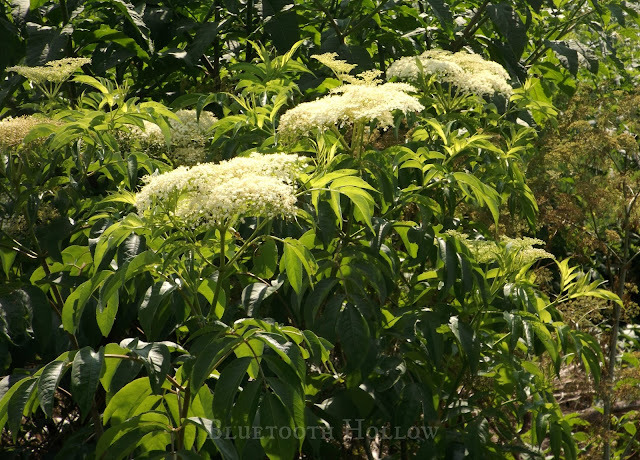 Common Elderberry growing rampant in an empty lot at the edge of town. Their leaves are opposite and compound with 7 sharply serrated leaflets that have a glossy appearance. They can have multiple stems; their bark having a bumpy, corky texture. The stem centers are spongy with a white pith. The white, flat-topped flower cymes can spread 8 inches across, and have a subtle, bittersweet fragrance. 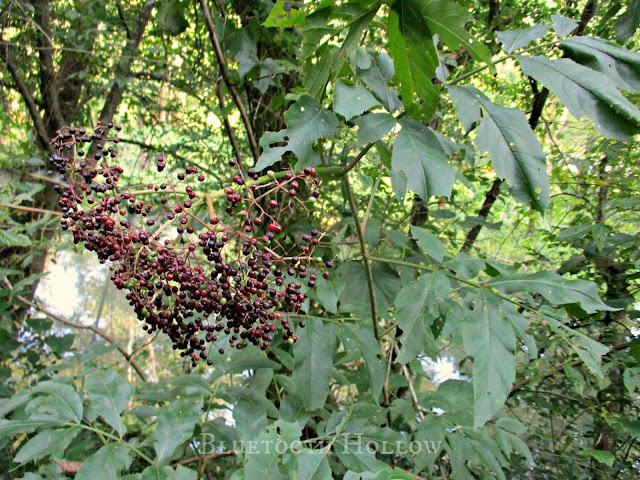 Its most renowned feature, of course, is its fruit: large clusters of black or purple berries hang heavy on the plant come late summer and early fall. 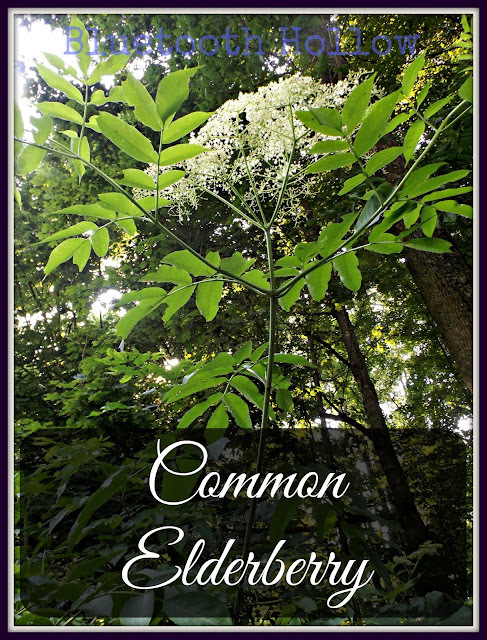 There are at least 30 species of Elder found worldwide. The name Elderberry has ancient origins, steeped in mystical European folklore. It is thought to have originated from the Anglo-Saxon word "Aeld," meaning "fire." Its Latin name is Sambucus canadensis. 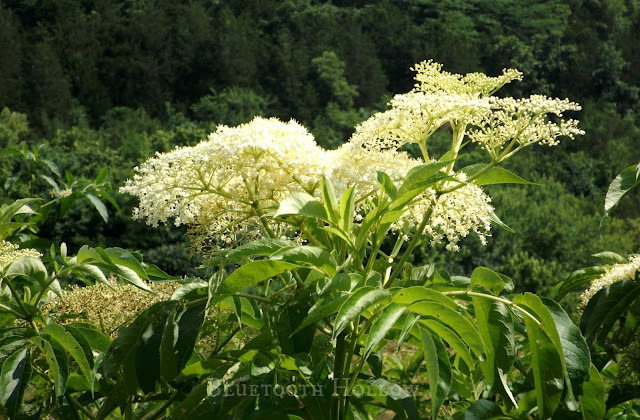 Sambucus originated from the Greek word "sambuke," which was a musical instrument believed to heal the spirit. 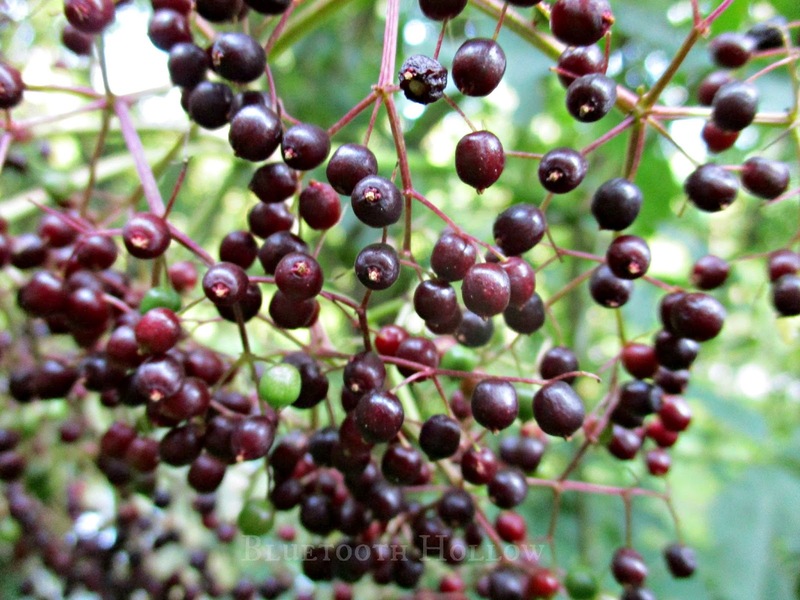 While Elderberry wood was used to make instruments in Europe, it was never actually used to make a sambuke. 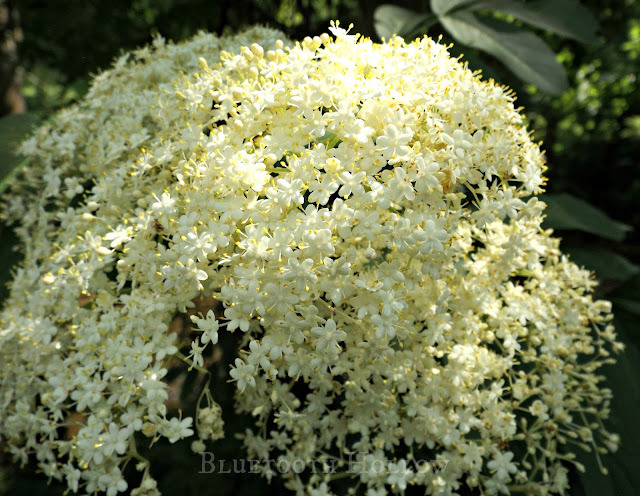 Elder has been called by many other names in its ancient past: Holler, Hylder, Hyllantree and Holunder (German); all of which refer to the plant goddess Hylde Moer, that had strong associations with Elder. The plant was considered sacred to her, and it was thought that dryads took up residence within it. 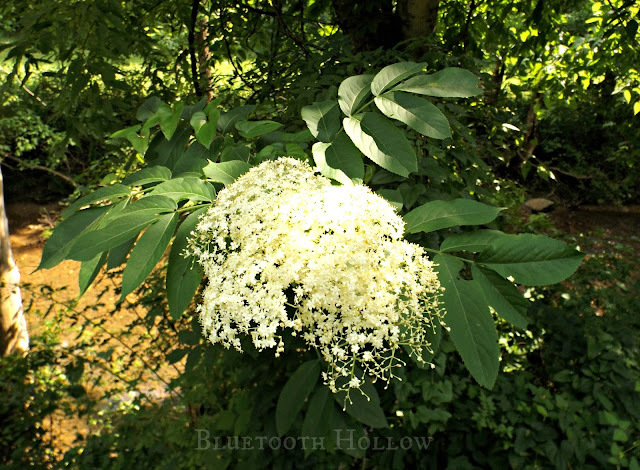 Elderberry was often planted around homes as a blessing and for protection from evil spirits. Prayers and offerings were made to the plants, in honor of the goddess and the dryads that served her. It was considered a grave sin to cut down an Elderberry tree or burn its wood. It was thought that the dryads would hunt down and exact vengeance on those that committed these offenses. This taboo persisted well into the last century. The only acceptable reason to cut down an Elder Tree was for use as medicine or protective charms. Even then, the harvester had to recite a special prayer to ask permission, if they wished to avoid negative consequences. Once Christianity became widespread in Europe, this sort of worship was discouraged, and the original meanings became distorted into dark magic and witchcraft. The Biblical association with Elder was sorrowful. It was believed that Judas hung himself on an Elder Tree after betraying Jesus. According to lore, this is why Elder has a bent growth habit, seemingly barely able to hold up its own weight. Elder continued to be a source of spiritual protection during the Middle Ages, for those who still practiced the old religion. Pinning the leaves on their doors was believed to keep away demons and evil spirits. Interestingly, this belief was widespread throughout the whole of Europe. Russia, Sicily and Scotland all had similar beliefs regarding the protective qualities of Elder. Around this time, the older religious beliefs began to merge with Christianity, evolving into even more beliefs about the magic of Elder Trees. Rituals involving floating the cut stems in water were supposed to reveal witches and sorcerers - but only on Christmas Eve. Other elaborate Elder Tree rituals associated with Christian holidays could do everything from repel snakes, give you the strength of 40 men, heal a toothache or keep worms out of furniture. Elder groves were also believed to attract elves and fairies, and if you were to hide in an Elder grove during the Summer Solstice you could be rewarded by a spectacle of these supernatural beings. Falling asleep under an Elder plant was said to induce a heavy slumber with vivid dreams (the fragrance is in fact, a mild sedative). 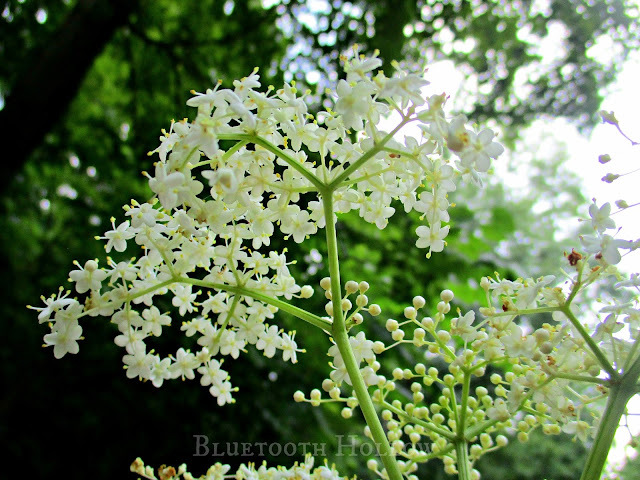 The flowers of most Elder species are edible, especially those of the Common Elderberry (Sambucus canadensis). The flower heads are delicious dipped in pancake batter and fried into a fritter. They can also be sauteed as a vegetable. The blooms can be steeped into a pleasant tea or brewed in vinegar and wine, adding a unique flavor and fragrance. Most people, however, are more familiar with Elderberry's fruit. To harvest the berries, it is faster to remove the entire stem, rather than try to remove the berries one by one. CAUTION: The unripe fruit and any other part of the plant except for the flowers are toxic. Even the ripe fruit can cause vomiting in sensitive individuals, so use caution. The fruit can be consumed raw or cooked, and prepared in a variety of ways. They can be baked into cakes, breads, muffins and of course, pies. 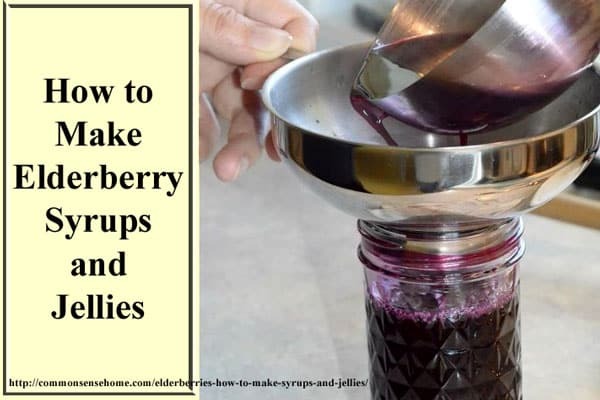 Elderberries can also be transformed into jams, jellies, sauces, syrup and wine. Elderberry fruit isn't very sweet, so be sure to sweeten as necessary. 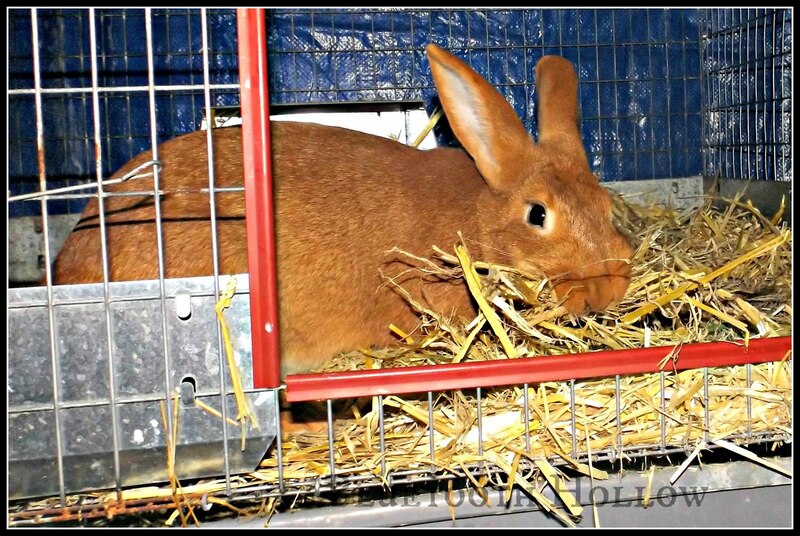 They are packed full of nutrition: extremely high in vitamin C, potassium and beta carotene, as well as phosphorus and calcium. There are Elderberry species that are not considered safe to eat. Avoid those that have red fruit that grows in a rounded cluster. 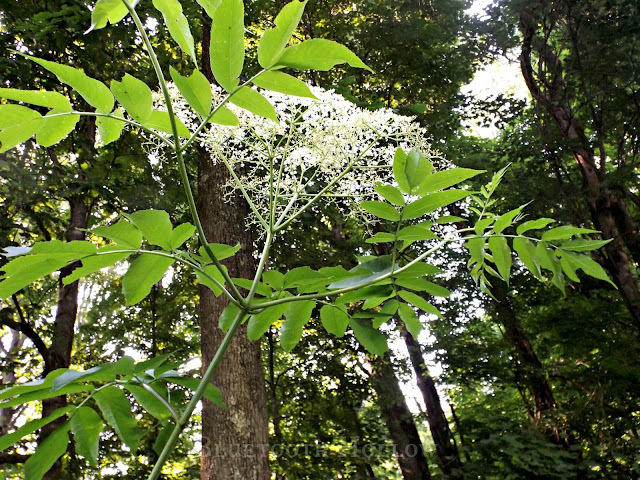 Hercules' Club (Aralia spinosa), also known as Devil's Walking Stick, is a toxic plant that is similar in appearance to Common Elderberry, but can be distinguished by its unbranched, thorny trunk. 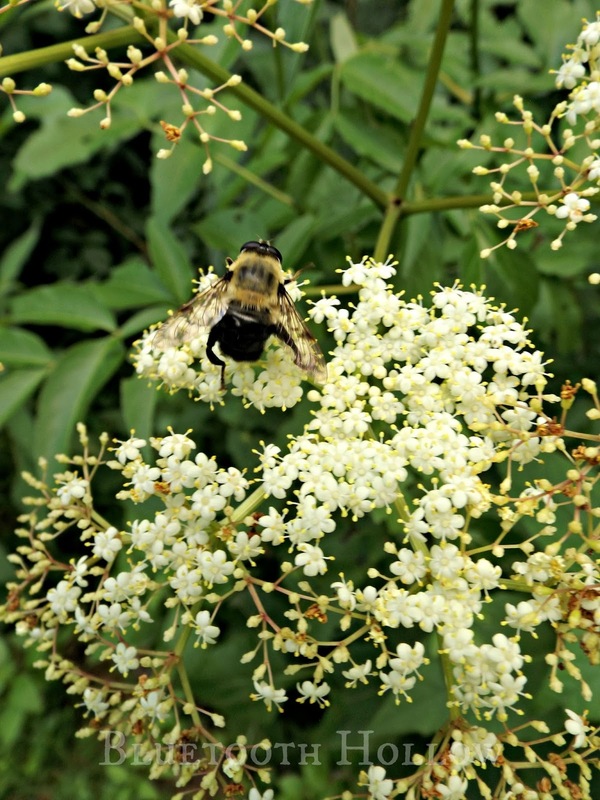 The history of medicinal uses for Elder is just as colorful and diverse as its folklore. There have been so many medical and practical applications for Elder throughout the millennia that a 230 page book was published in the Middle Ages dedicated to all the uses for the Eldertree, from "toothache to the plague." 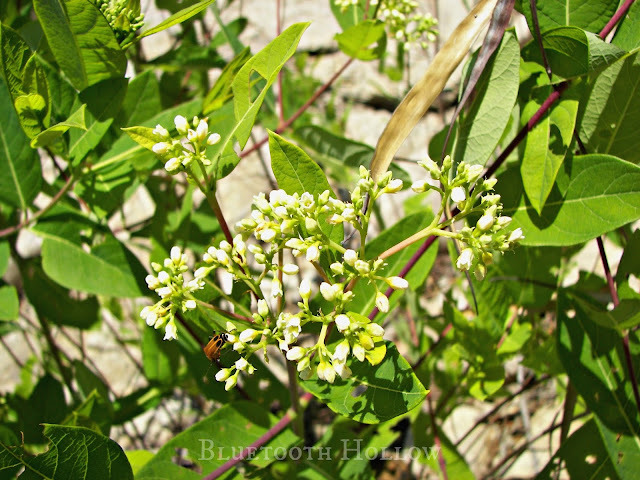 Hippocrates even mentioned the healing properties of this plant as early as 400 B.C. A tea brewed from the inner bark and root bark was used as a powerful diuretic, emetic and laxative. The same tea was also used stimulate labor and soothe headaches. An ancient and popular remedy for rheumatism was to wear an Elder twig as an amulet, held close to the skin. The inner bark pounded into a poultice was applied for the treatment of cuts, bruises, and inflamed joints to reduce pain and swelling. 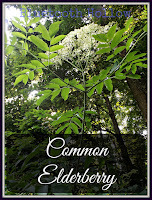 Elder flowers also have a number of medicinal applications. They act as a stimulant, and when brewed into a tea, act as a diuretic and diaphoretic. A flower tea was also used to treat infant colic and soothe children's upset stomachs. A flower infusion or tincture was used as an expectorant and can be useful in the treatment of colds, flu and asthma. An infusion also has astringent and antiseptic properties, good for treating numerous skin ailments. The fruit has many of the same medicinal properties as the flowers, helpful in the treatment of colds, sore throats and as an expectorant. When the berries are brewed into wine, it is said that their anti-arthritic properties are extracted and help alleviate rheumatic pain. 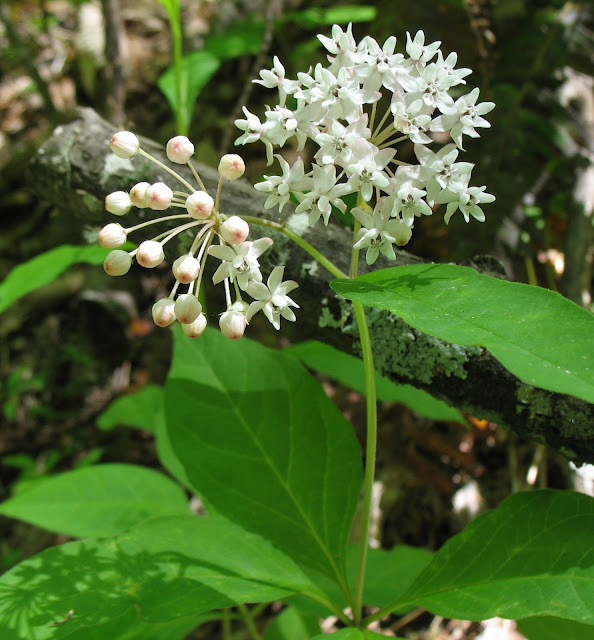 The Cherokee people made a salve from Elderberry for burns and skin eruptions, and apply leaves to sores to help stave off infection. They would also drink a berry tea to treat arthritis. 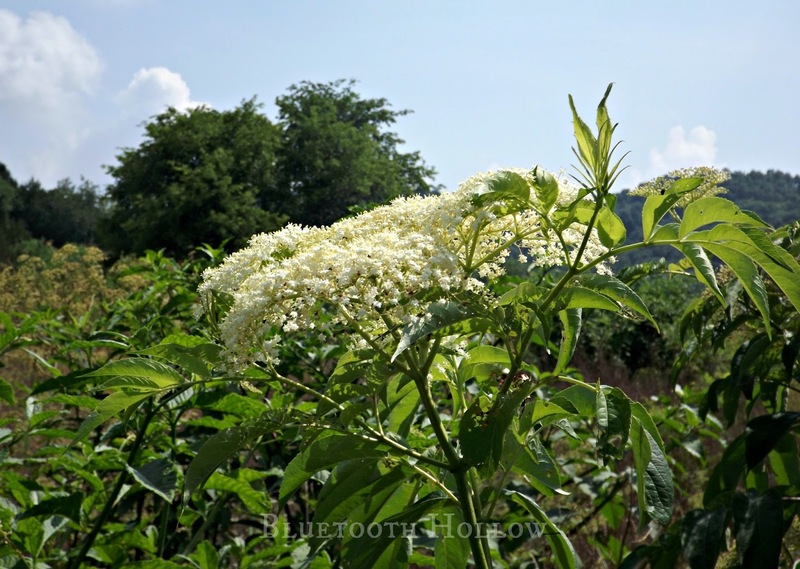 Modern herbalists use Elderberry and many of the same ways. Do not attempt to self-medicate using wild plants without the guidance of a professional herbalist. Besides food and medicine, Elder has had many other uses. Elderflower Water, distilled from the blooms, was highly prized during the Victorian era as a nourishing and firming tonic for the skin. If you boil the flowers in vinegar, it creates a black hair dye. 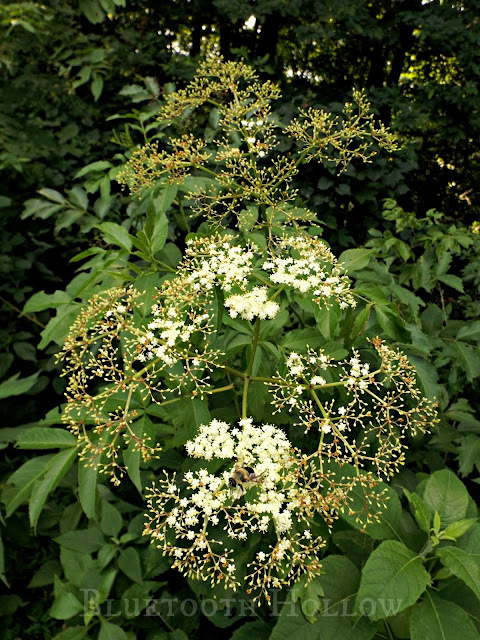 Dried, crumbled Elderberry leaves can be used as a natural insecticide. The dried flowering shoots are also said to repel rodents. Boiling the leaves in water produces a strong tea that can be used as a natural pesticide and fungicide for garden plants. Its usefulness doesn't stop there, either! 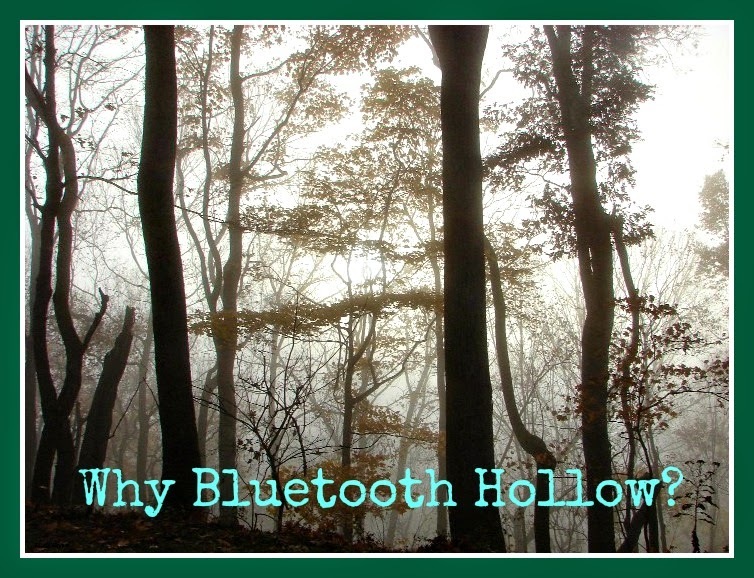 It provides a wealth of food and habitat for wildlife. 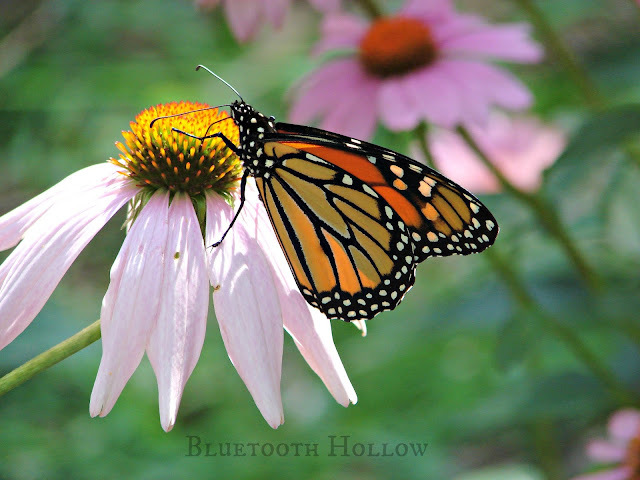 Pollinators of all kinds visit the flowers for their nectar. More than 4 dozen bird species consume the fruit, and they are especially enjoyed by bears. 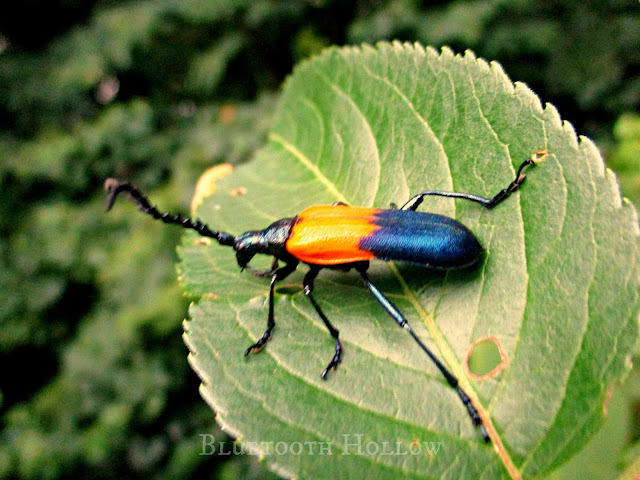 It is a beetle named, not surprisingly, the Elderberry Borer (Desmocerus palliatus). One would expect, give its name, that it is a pest for Sambucus, but that is not the case. As soon as a female Elderberry Borer emerges from her pupal den, she "calls" to the males by emitting pheromones. After mating, she lays her eggs at the base of the Elderberry plant. Once the eggs hatch, the larvae bore their way into the the roots and stems to feed. Whenever they are ready to pupate, they migrate to the soft pith of the plant and create their pupal cell, emerging as adult beetles the following spring. As adults they feed on Elderberry pollen, and do not cause any significant damage to the plants with their life cycle. If you spend time around Elderberries in bloom, you may be gifted with the sight of this magnificent little beetle. The old Elder Tree has been a faithful companion to mankind for as long as history has been recorded. 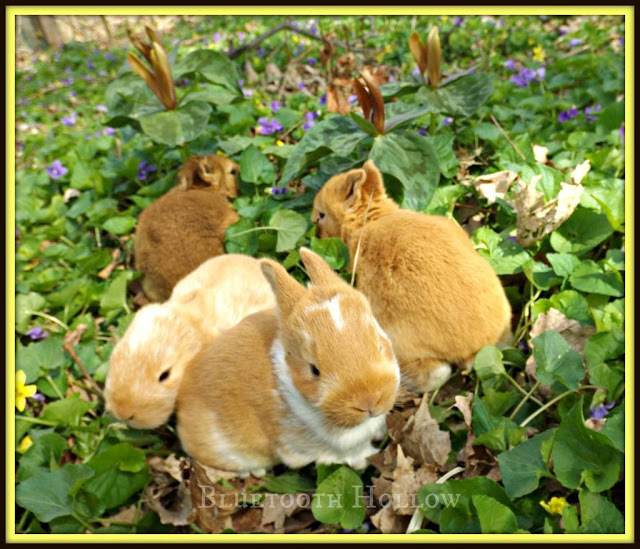 Consider planting one in your own yard. Even if you don't find a use for it, the wildlife will. And if you happen to fall asleep underneath it on a mid-summer's eve, be sure to let us know if you see any fairies. Right now, there is a tall plant blooming in the fields adorned with fragrant purple globes that almost every pollinator finds irresistible. 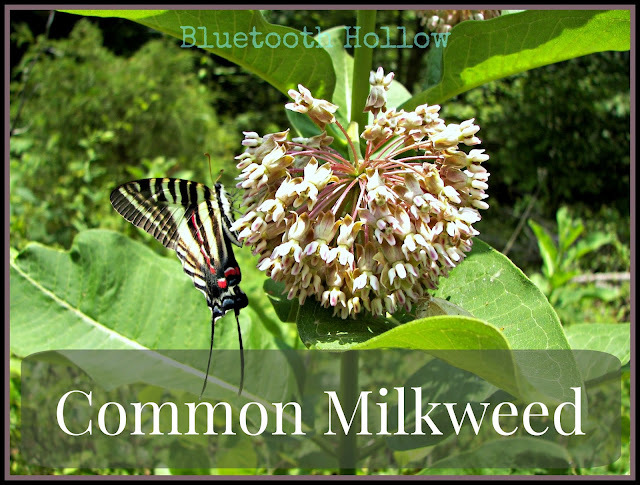 Common Milkweed is just about as common as its name suggests, but just because it is familiar, that doesn't mean it isn't indispensable! Almost everyone in the United States (except for those living in the Southwest) have encountered this jubilant plant marching across a field or waving at us from the roadsides. Standing up to 5 feet tall, Common Milkweed has distinctive features in all seasons. The opposite, oval-shaped leaves measure 4-6 inches long, and are smooth above and downy beneath. 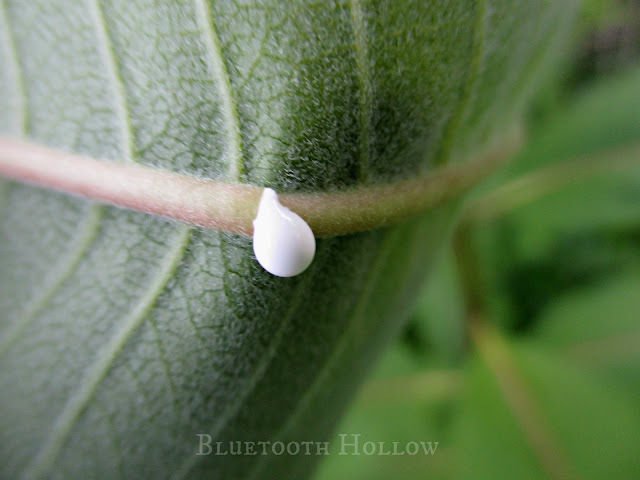 If you break the midrib on a leaf (or any other part of the plant), a thick, sticky, milky sap will flow. 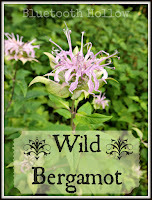 Its blooms waft a most delicious perfume, and can range in color from grayish lavender to dull rose. Upon closer inspection, one can really appreciate the uniqueness of a Milkweed flower. They have 5 reflexed corolla lobes, each with a "hood" to match its "horn." 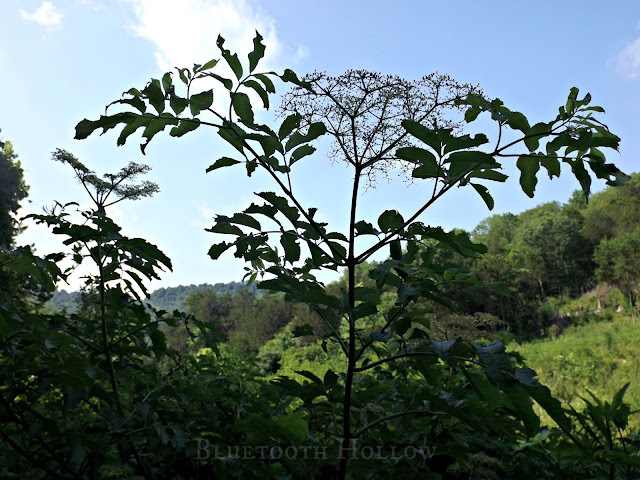 These flowers are borne on umbels measuring 2-4 inches across. After the blooms fade, a seed pod forms. Within this capsule are thousands of seeds, just waiting for the pod to split open so they can spread their silky parachutes and ride the breeze. 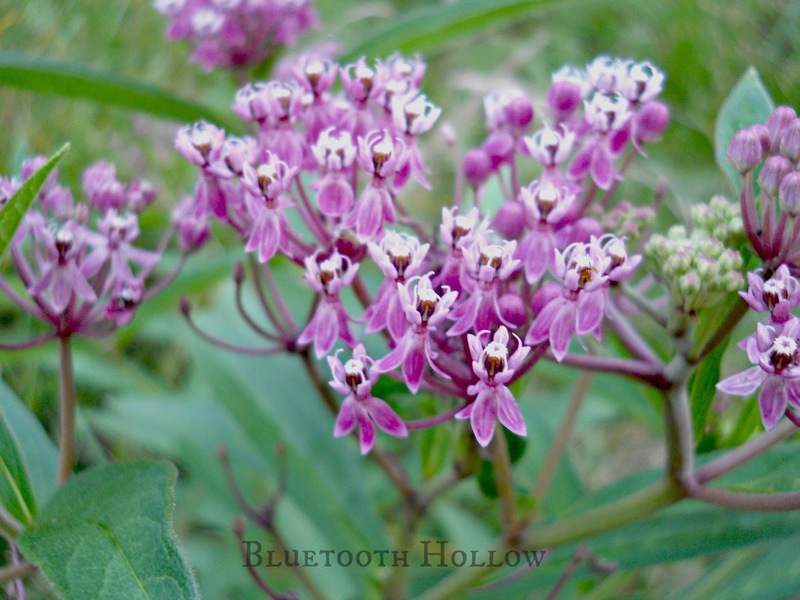 Its Latin name is Asclepias syriaca. Asclepias is after the Greek god Aesclepius - the god of doctors and medicine. Syriaca means literally "of Syria." This name was actually the result of a blunder made by Linneaus himself, who mistakenly believed that Common Milkweed was indeed from the Middle East. This geographical mistake apparently wasn't enough to have the name changed, so syriaca it shall remain. The genus Asclepias is such a colorful and diverse group that other members deserve mention. Thirteen species of Asclepias can be found in Tennessee alone, with 140 existing nationwide. 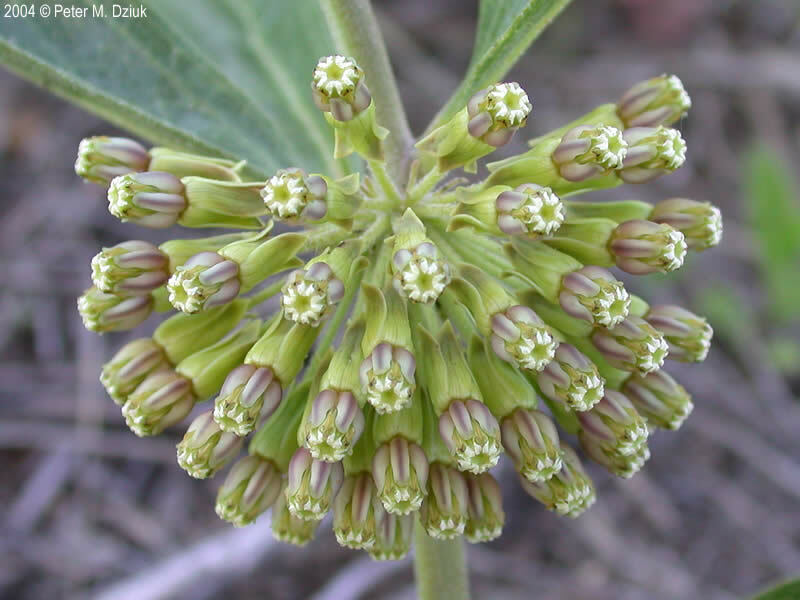 and probably the most unique, Antelope Horn Milkweed (Asclepias viridis). 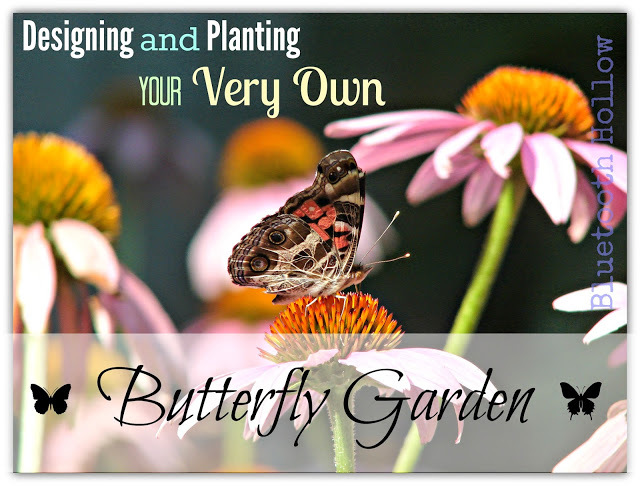 Any of these would add interest and wildlife value to your yard if included in your gardens. 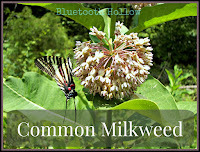 Many people don't realize that Common Milkweed also has value as a food source. The shoots up to 8 inches tall can be boiled in two changes of water to rid them of their bitter, white sap. While it is toxic, the effects are largely mild, and would take large doses to really make somebody ill. The cooked shoots are said to taste like green beans. The unopened flower heads can be prepared in the same way, and are said to have a flavor akin to broccoli. Once the flowers open, they can be parboiled for one minute (they contain far less sap) and added to pancake batter to make fritters, or even added to soups, stews and casseroles. The flowers can also be boiled into a syrup, creating a brown sugar. One can also shake the dew-laden blooms into a bowl to collect "nectar water." The immature seedpods can also be boiled in two changes of water and eaten as a vegetable. 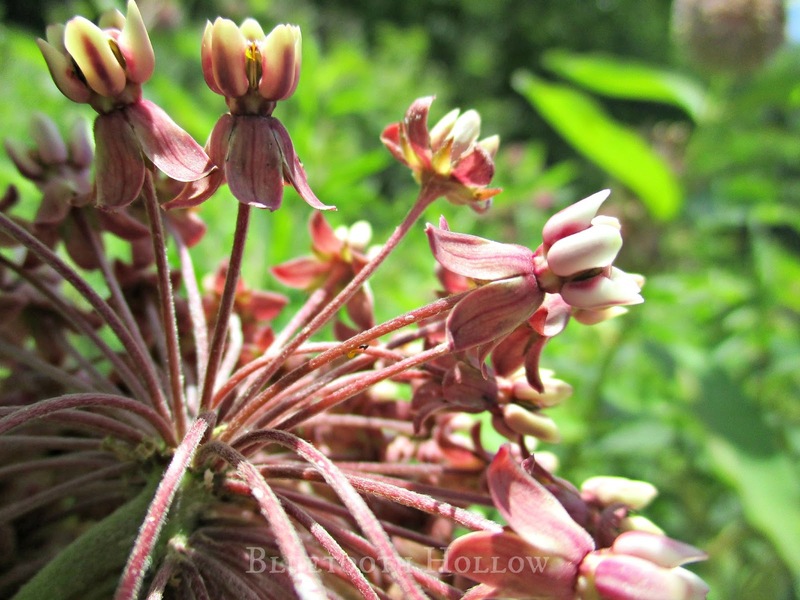 The Iroquois and Chippewas were known to consume Common Milkweed, eating the shoots, buds, flowers and immature seed pods. The flowers were often stewed, and even dried for winter use. 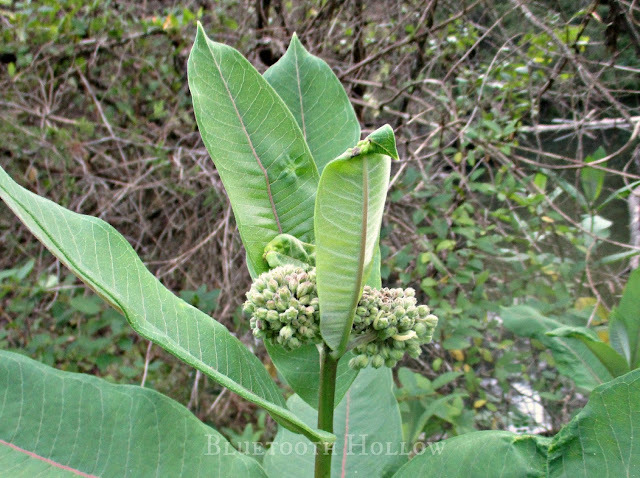 CAUTION: Milkweed should not be gathered and eaten without the guidance of an experienced forager. There are other members of this plant family that are VERY toxic that are similar in appearance, especially in the shoot stage. Dogbane and Butterfly Weed are two of these. 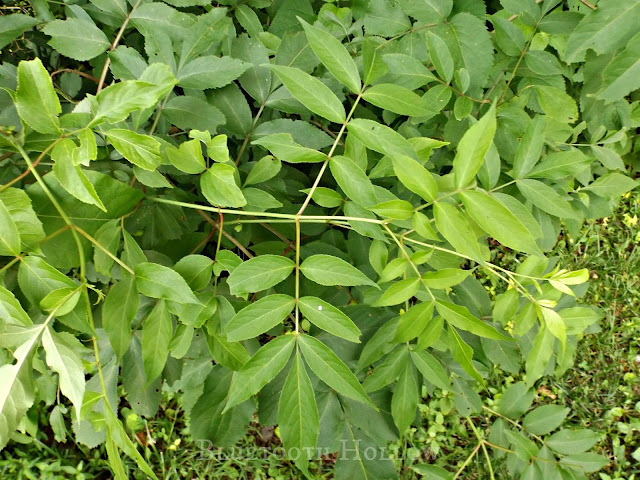 Indian Hemp (Apocynum cannabinum) is a type of Dogbane commonly found throughout TN. 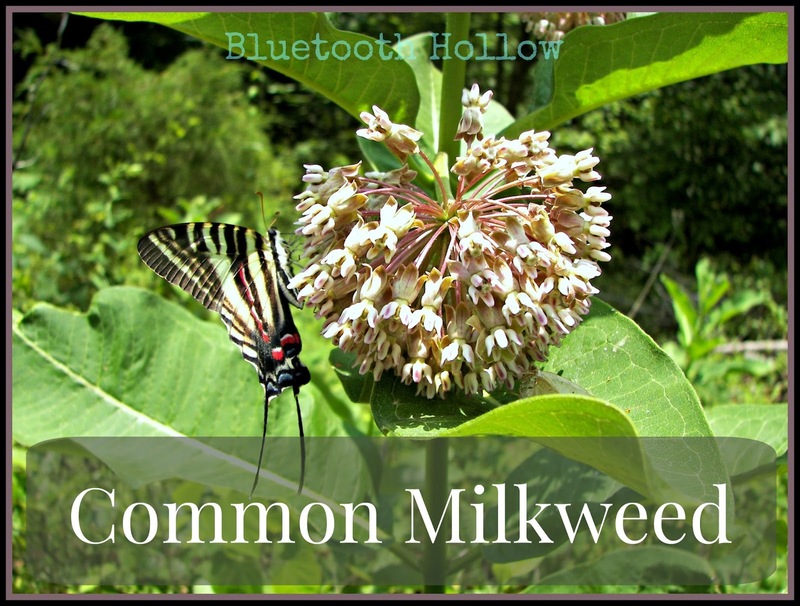 Every part of the Milkweed plant has had medicinal uses, historically. The milky sap was used to remove warts. The root has be used to treat kidney stones and asthma. Some Native American tribeswomen would use the pounded roots as a contraceptive. 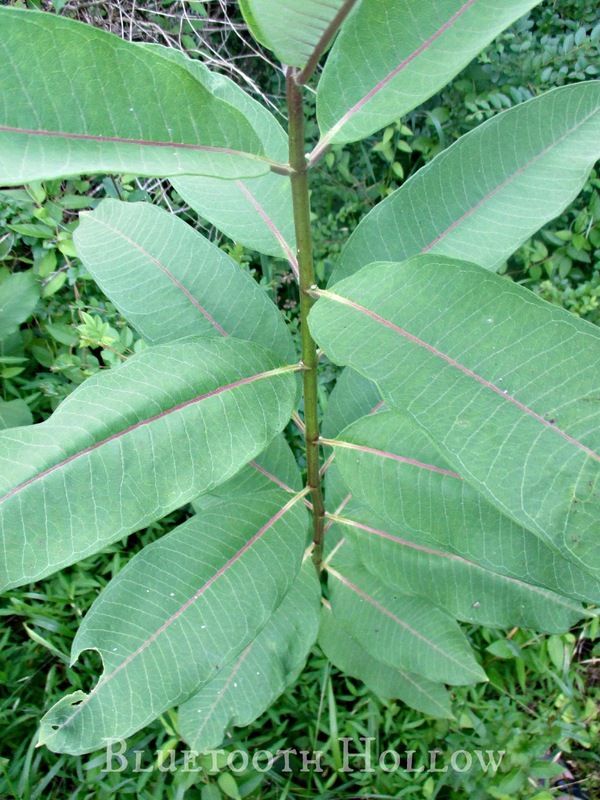 The leaves and latex were used to treat some types of cancers and tumors. Cooked stems were made into a poultice and used externally to treat rheumatic joints. The Cherokee would drink a root tea for a backaches, the treatment of venereal diseases and as a laxative. 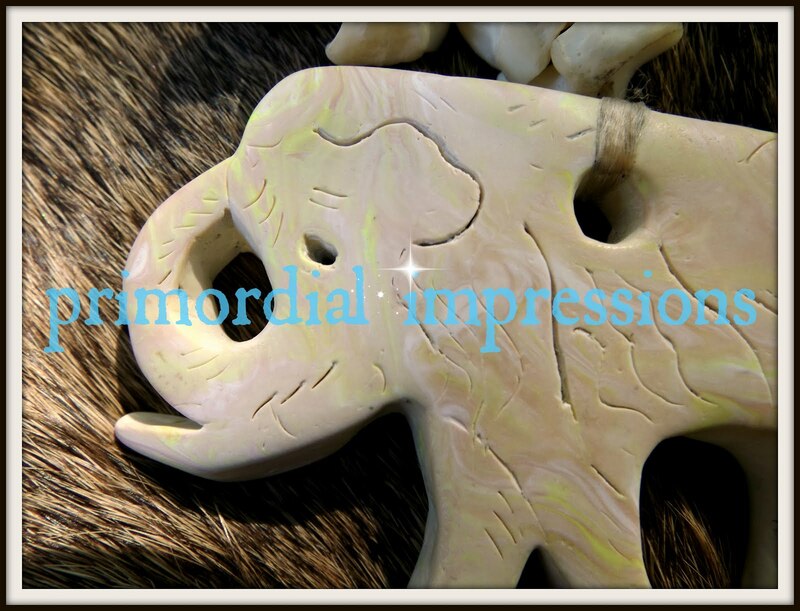 In addition to food and medicine, Common Milkweed has also had some great practical uses throughout human history. The Cherokee would use the plant fibers for bow strings. Plant fibers collected from the stems in the fall could also be used for textiles, paper and twine. 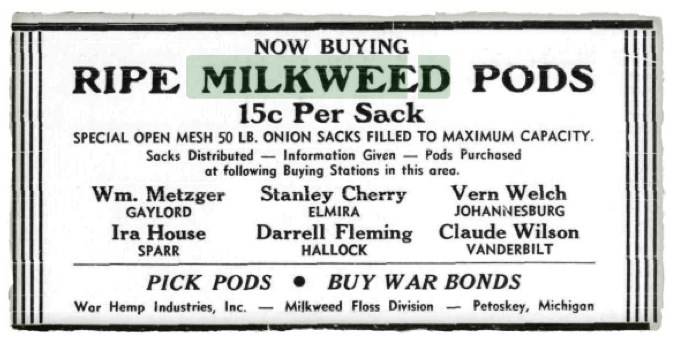 During World War II, children were employed to collect milkweed seed pods. The fluffy silk fibers are incredibly buoyant, and were used to fill life preservers and flight suits for American soldiers. During this time scientists also attempted to manufacture rubber from the sap, but were not successful. 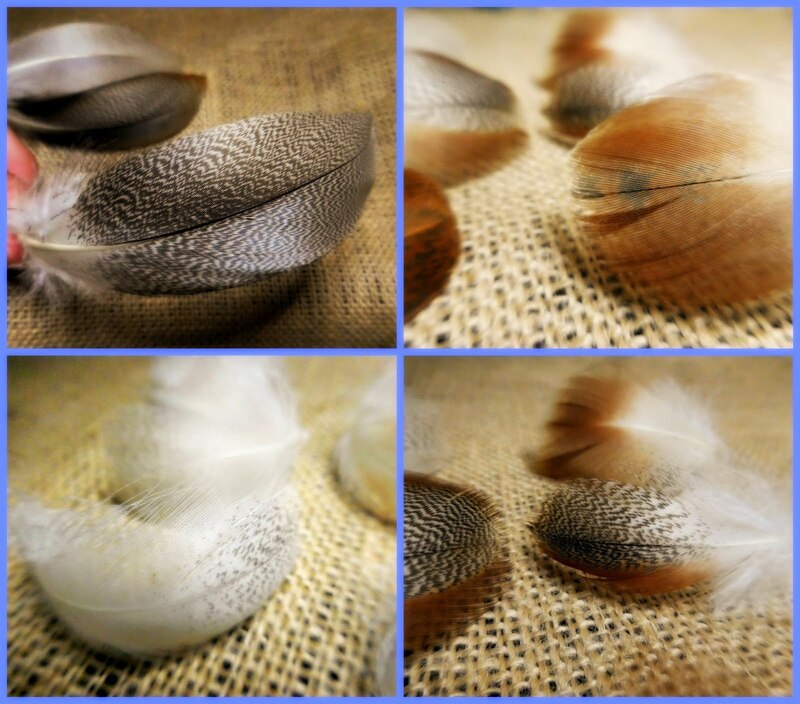 The seed floss also has the unique properties of simultaneously repelling water and absorbing oils, which make it useful for mopping up oil spills at sea. A Monarch's larvae feed on the leaves of Asclepias species, and nothing else, and are especially partial to those of Common Milkweed. A female Monarch laying eggs on milkweed shoots, nearly the second they appeared. 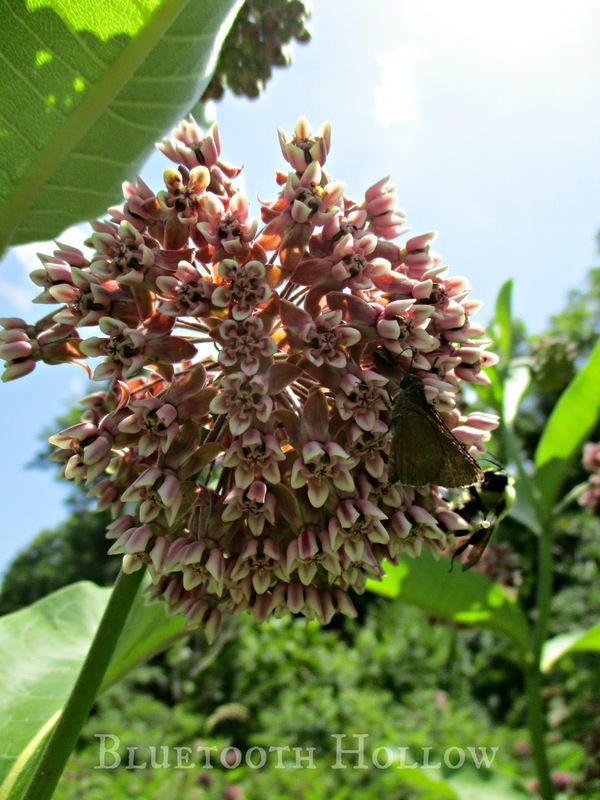 Milkweed is unpalatable to almost every other species because of that milky sap that runs through it. 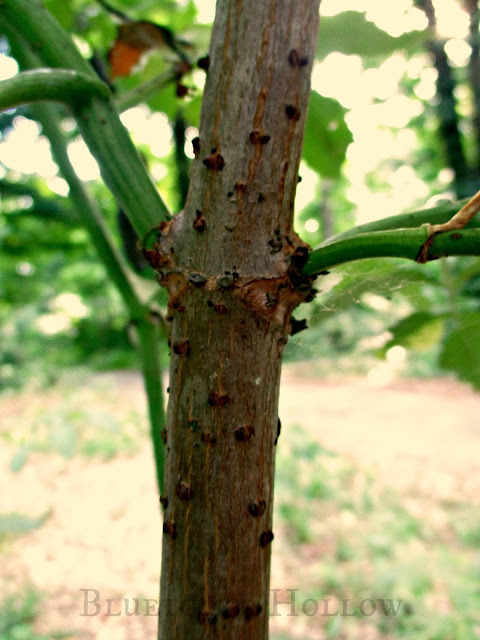 It deters most other insects, which often get stuck in the sap once they puncture the plant. The bitter alkaloids are transferred to the caterpillars, imparting an even more bitter taste to the adult butterflies. This offers protection from predators, especially birds. A young bird that makes the mistake of eating a Monarch butterfly for the first time will soon find itself violently ill. They learn quickly to merely tag the hindwings of any butterflies they wish to eat, just to test the flavor (this is why you will sometimes see butterflies with missing wing parts). 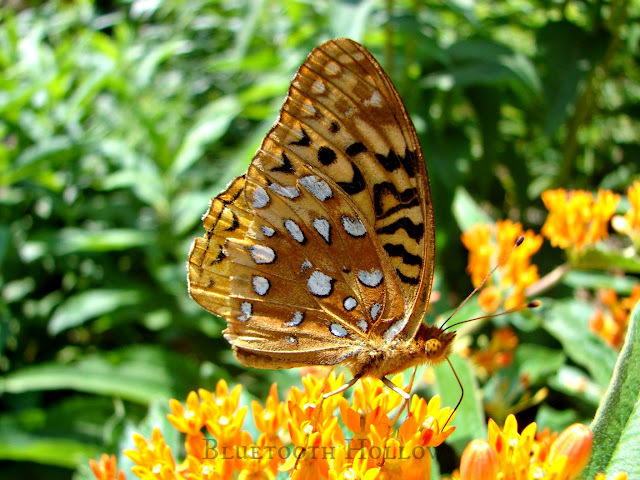 This Great-spangled Fritillary has been tagged by several birds. In recent years, Monarchs have been in significant decline. 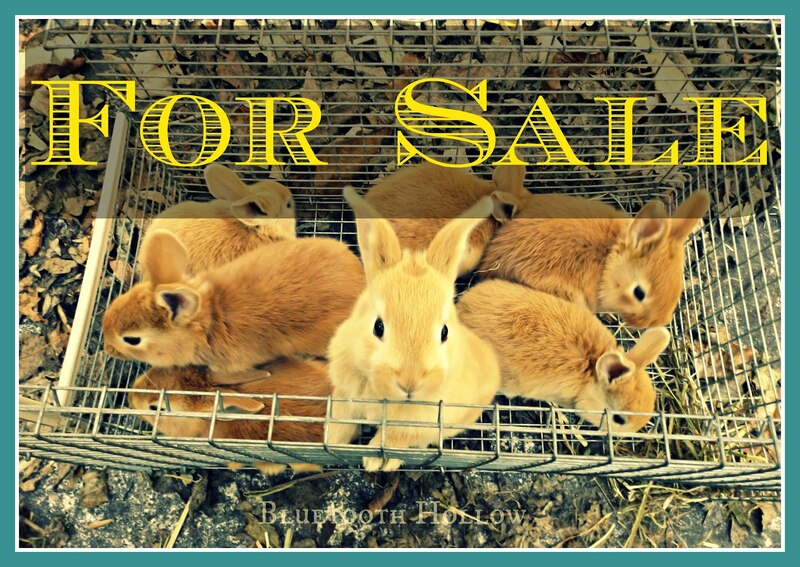 It's estimated that their populations have plummeted by as much as 90 % in the last 20 years. The main culprit is believed to be, not surprisingly, genetically modified crops. In addition to the liberal use of glyphosate pesticides, Monsanto scientists insert a bacteria (Bacillus thuringiensis) into corn germplasm to kill pests like corn borers and earworms. Because corn is wind pollinated, there is no way to control the escape of this bacteria. 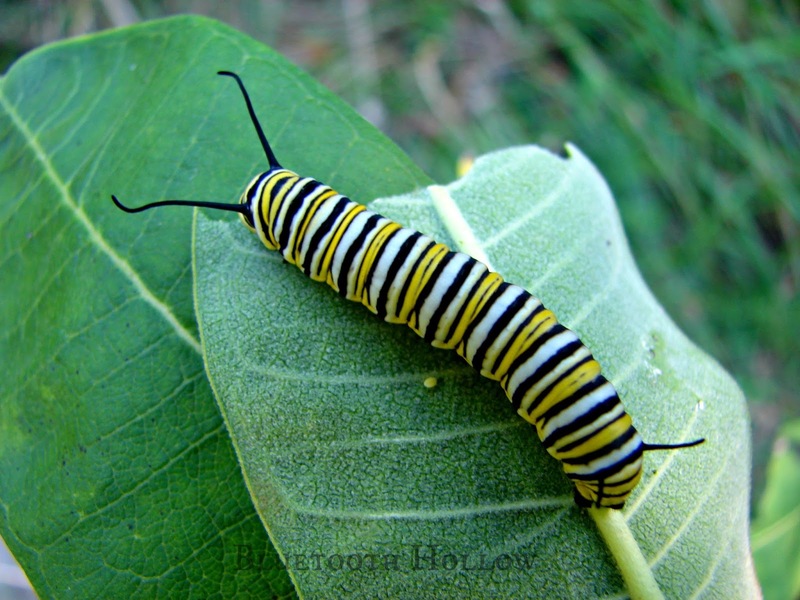 Unfortunately for Monarchs, and every other caterpillar, this can have a detrimental effect. (Interestingly, it is easily purchased and touted as a "natural pesticide," and indeed it is found in the soil, but the circumstances we have created are anything but natural, and the environment is paying the price.) 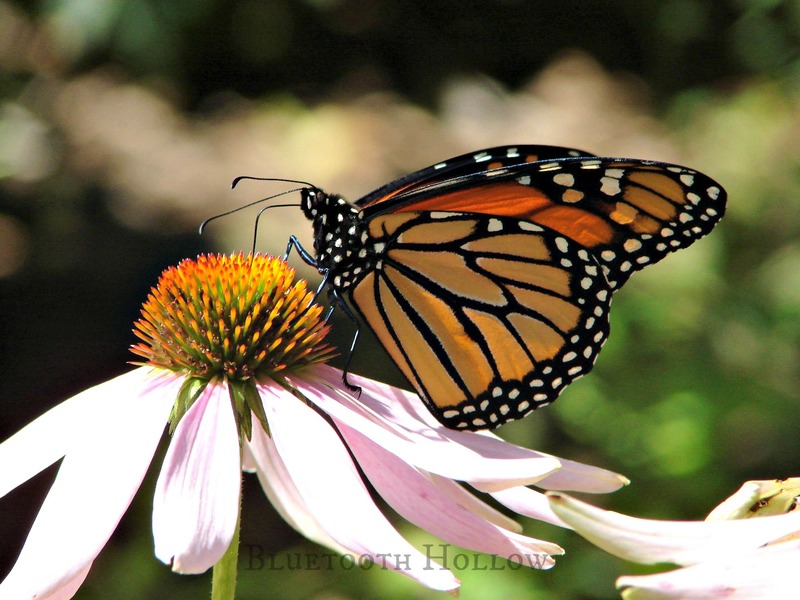 According to the EPA, studies conducted on this practice do not suggest toxicity in not-target butterflies, such as Monarchs. 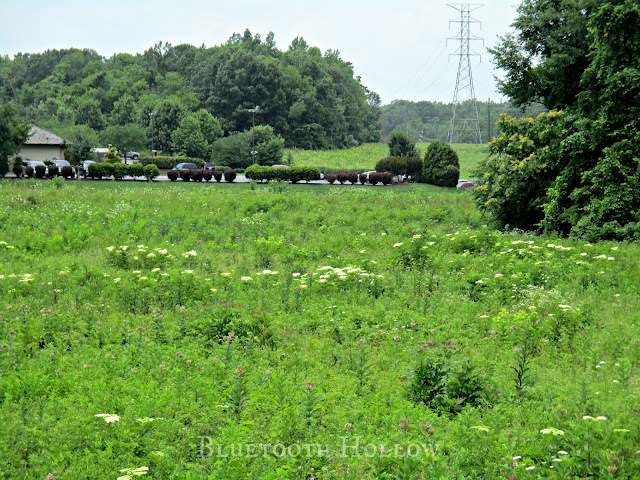 Their reasoning is that milkweed doesn't grow close to crop fields (um...... really??? Last time I checked milkweed likes roadsides, and I have frequently seen it growing alongside to crops). Oh, look! What is this growing in the middle of a GMO soybean field? In addition to this, the absence of milkweed due to habitat loss can stop them in their tracks on their migration northwards. The other big factor is loss of their wintering habitats. 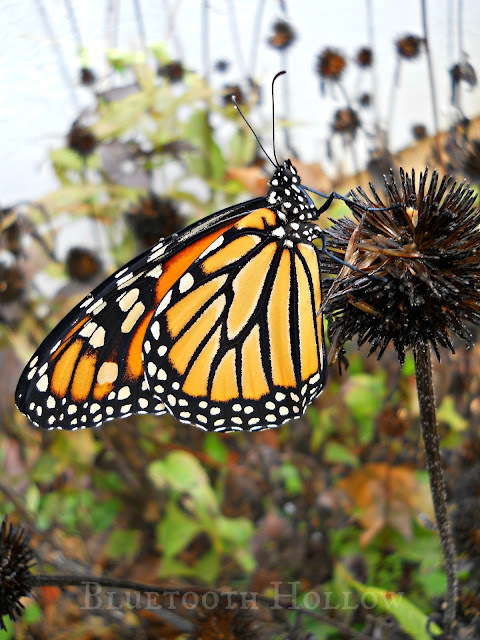 Monarchs are the only insect known to truly migrate. They have several broods in a season, with each generation moving further north, following the milkweed bloom. The final generation is known as the "super generation," living longer and flying stronger than its predecessors. 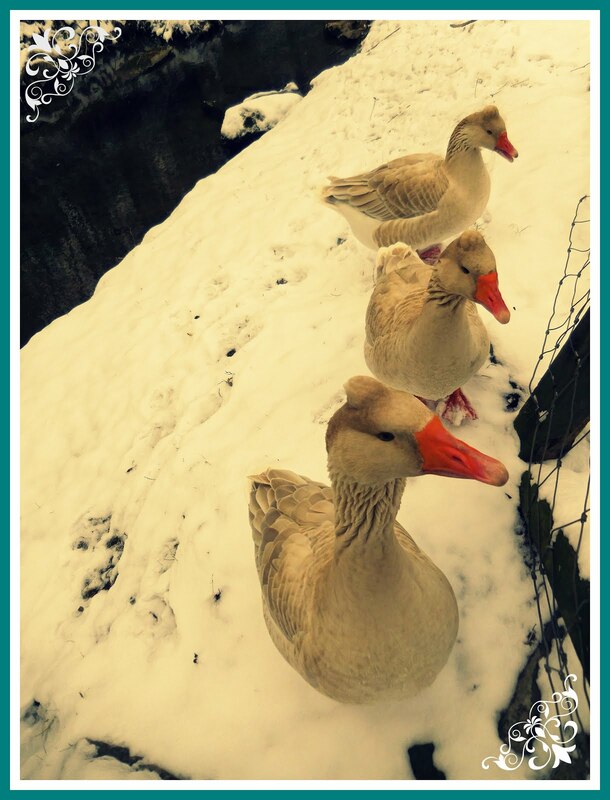 They make the long trip south to California and Mexico, where they spend several months waiting out the winter. 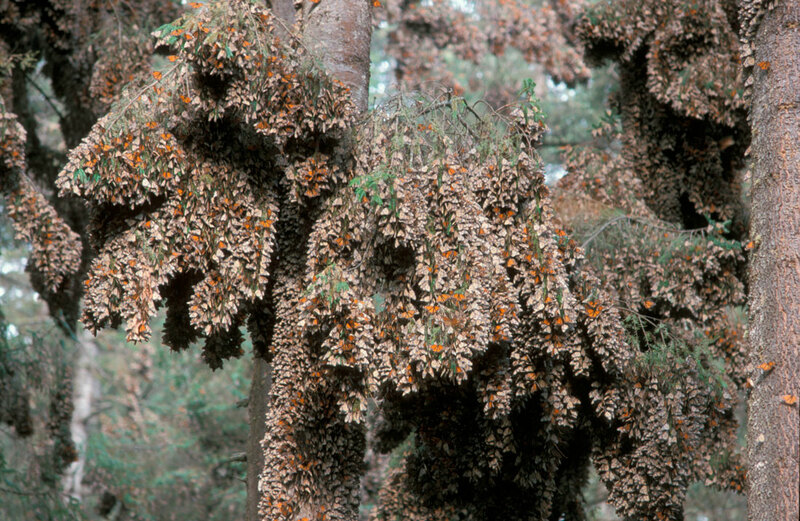 The Eastern Monarchs travel to the Sierra Madre mountains of Mexico, while the Western Monarchs fly to the California coast, near Santa Cruz and and San Diego. Some fly as far as 3,000 miles! Monarch fall migration patterns. USGS National Atlas. They form massive colonies, hanging off the trees in a magnificent and memorable display. 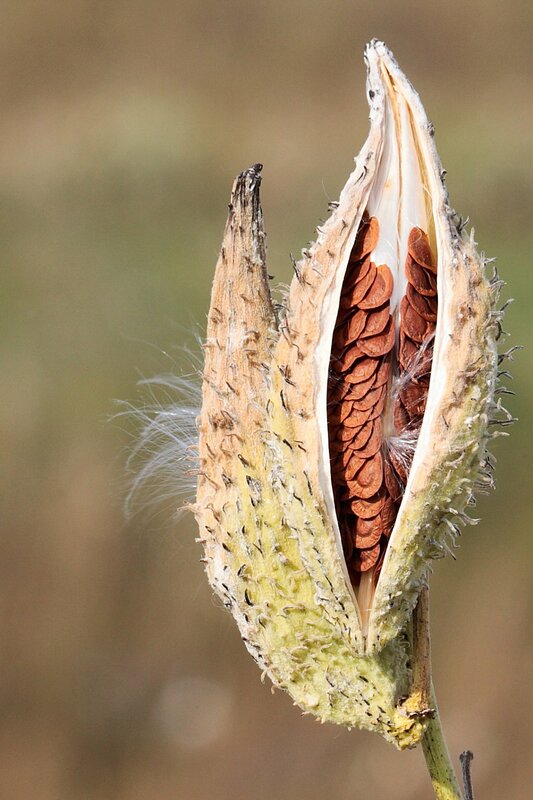 Once the weather warms and the first milkweed plants emerge, they fly north to lay their eggs and then die, passing the torch to the next generation. Spring and summer migration patterns. USGS National Atlas. 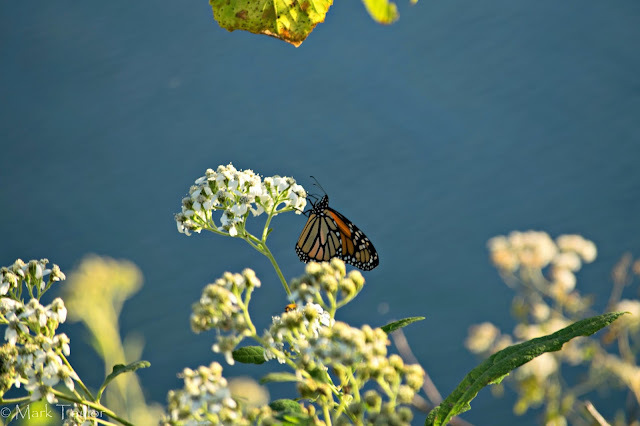 While pesticides are the biggest issue, you can help by either planting milkweed or allowing milkweed patches and native wildflowers to remain in areas on your property. 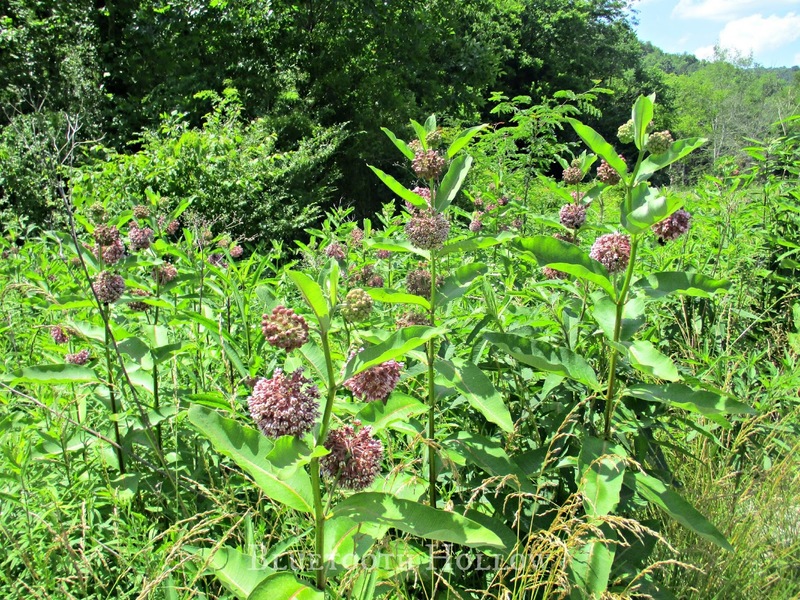 There are several stands of Common Milkweed growing in our area, and we planted it, as well as Butterfly Weed, in the park butterfly garden several years ago. 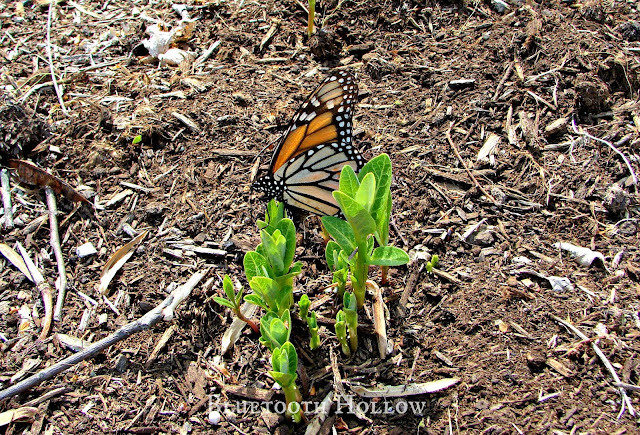 We were regularly getting Monarchs passing through the park, utilizing the milkweeds for their larval food source. A few years ago, we stopped seeing them. I have checked and re-checked the plants for caterpillars to no avail, and we don't see any adult butterflies nectaring until they are passing through on their Southern migration in the fall. It is very disheartening, but this has been the same sad story statewide, and throughout much of the country. 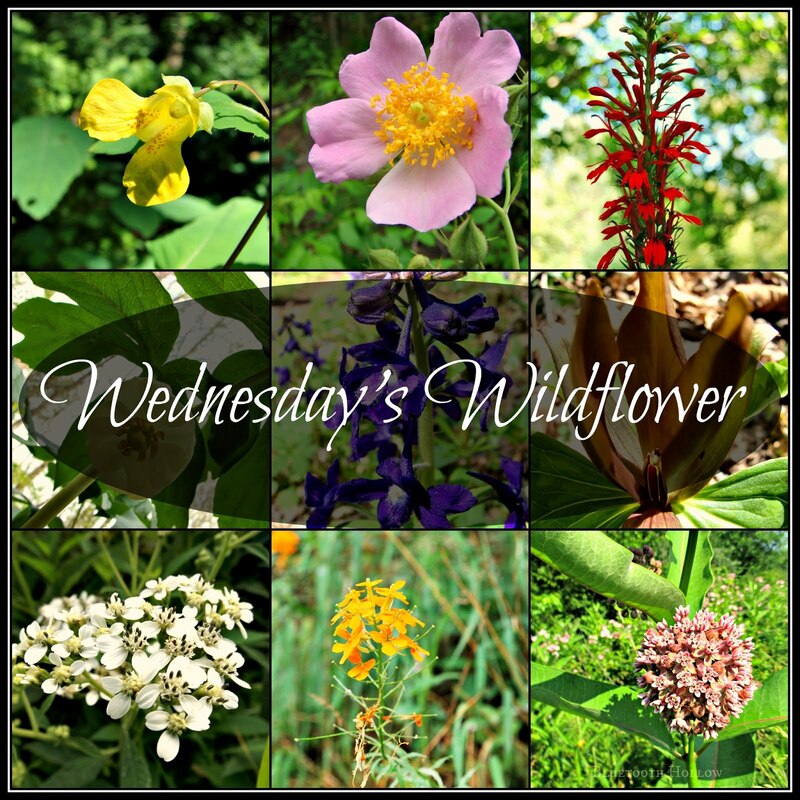 If you happen to live in Tennessee, the Tennessee Wildlife Resources Agency is distributing free seed packets that include a nectar wildflower mix in addition to milkweed. 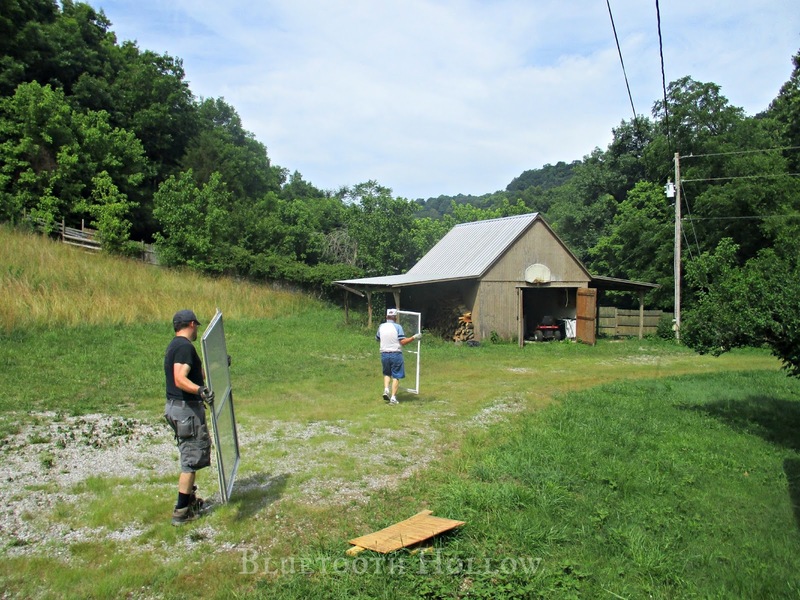 You can read more about it here: http://www.wpsdlocal6.com/story/29262713/tennesseans-are-being-asked-to-help-save-monarch-butterflies. For those of you located outside of Tennessee, Roundstone Native Seed Company is a fantastic source for native seed and seed mixes, and offers seed mixtures specific to your region. While Milkweed is essential for Monarch reproduction, make sure you include plenty of other nectaring plants in your fields and gardens. The latest research indicates that the biggest limiting factor for Monarch survival isn't simply a lack of milkweed as previously thought. 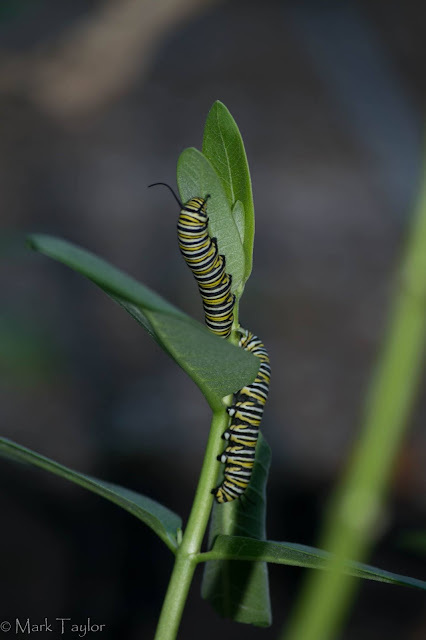 The biggest declines in Monarch numbers occur during the final generation's southern migration in the Fall when they are done reproducing and the milkweed has long since faded. These Autumn blooms are critical for fueling their journey south, and most of them appear on their own if you simply allow fields and forest edges to grow. So while milkweed is still an awesome plant to propagate and promote, it isn't the whole picture. Even if we aren't seeing Monarchs visiting the milkweed these days, just about every other pollinator goes crazy for its sweet nectar. 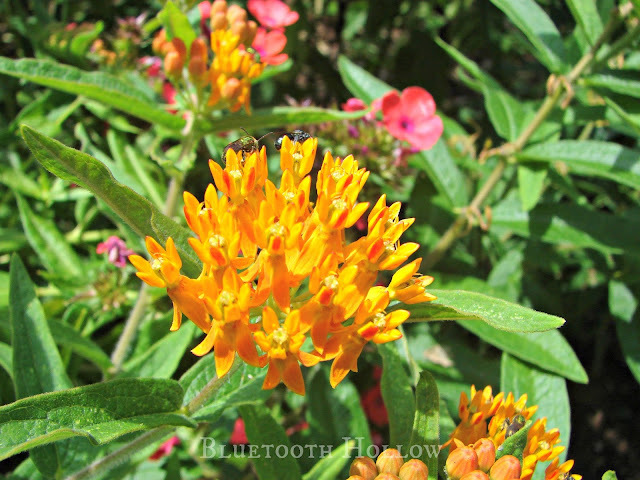 Most species of butterfly, bee, wasp, many species of beetles and of course, hummingbirds, benefit greatly from milkweed flowers. As for me, there is hardly any fragrance I enjoy more once the summer starts to crank up. 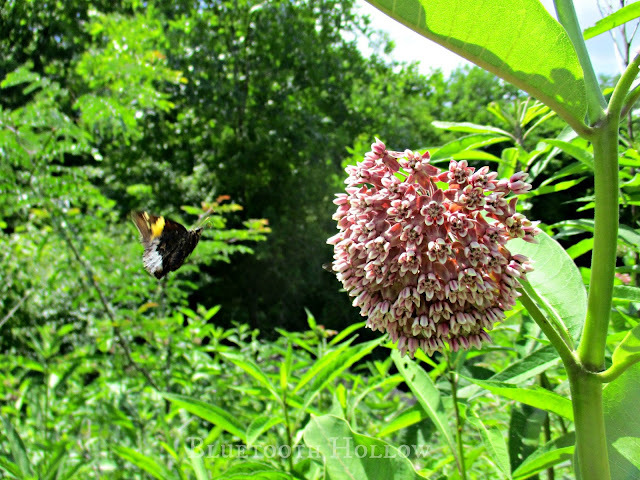 Find yourself a patch of milkweed and show it some love; this amazing plant deserves no small praise. 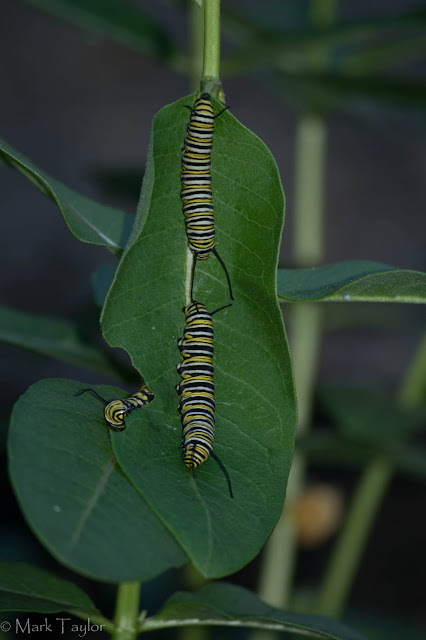 Late last summer, we discovered the first Monarch larvae on our local milkweed plants in several years! The biggest reason for their recent population decline in the East was due to a hard freeze in their wintering habitat in Mexico, which killed off millions of Monarchs. At least locally, their breeding population appears to be on the incline once again. 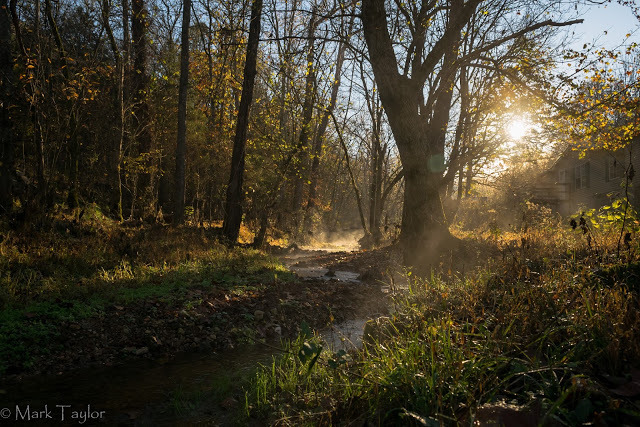 We'll keep providing great reproductive and nectaring habitat throughout the seasons!